We said we wouldn’t do any gigs in August, what with preparing for our September wedding. But Liverpool’s Bombed Out Church is pretty special. 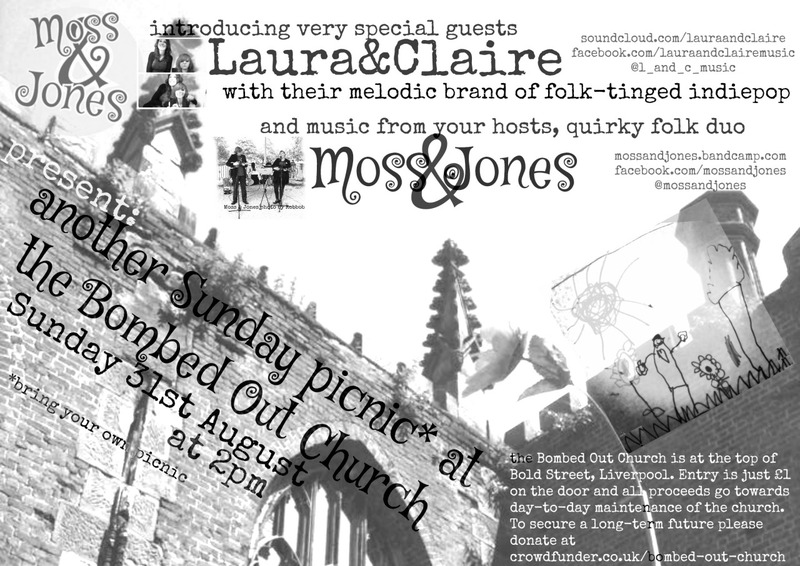 We’ll be there on Sunday 31st August at 2pm playing our usual mixture of melodious originals (including that one about the Kirkby ice cream vans selling - whatever it was, Ruth never did find out - in winter), traditional folk (we might get a bit mediaeval on you actually. Or at least, Tudor) and imaginative covers (yes, that includes Ebeneezer Goode). We’re also really excited about our special guests. Laura&Claire are the kind of duo we absolutely love. Two young women with beautiful voices playing guitars and singing the kind of vocal harmonies that simply sweep right through you. We heard them at an open mic at the Brink, Liverpool, and were absolutely blown away; we reckon you will be, too. Entry is just £1 on the door and all money goes to the day-to-day maintenance of the Bombed Out Church. Now, we know we go on about this but it’s really important. If you’d like to help secure a long-term future for the Bombed Out Church, rather than see paradise paved and a Starbucks put up, they really do need your help. There have been a lot of rumours lately about how apparently someone is going to give them a tonne of money, which has made people believe they don’t need to donate after all. Unfortunately, this is little more than political posturing; the Bombed Out Church really does need your help. Please give what you can; even for just £2 you’ll get a big thank you, plus the knowledge you’re doing something amazing. Families are very welcome; we love to play whilst watching the kids - including our own - run about. Please bring friends, nans, grans, granddads, mums, dads, sisters, brothers, cousins, avuncular relatives, bezzies, mates, a posse, people you met on the ‘bus… and anyone else you can think of. We’re looking forward to it!